Hands up if you hate Athlete? Its almost become a ritual standing joke amongst the cogniscenti of the indie-than-thou elite to pour scorn on the Deptford four piece. And yet up to now (but more of that later), I have always failed to see the point. Sure their music isn't gonna inspire 15-year-old spotty boys to hastle their mum and dad for a 'V' shaped stratocaster next Christmas, and its not going to inspire stagediving on a level that would put those 853 people to shame. But then, when did Athlete ever promise such things in the first place? For all the people who supposedly found their first record 'Vehicles And Animals' dull and uninspiring, it sure as hell shifted enough units to warrant making a follow up - about 300,000 and rising at the last count. For those of us who actually found 'Vehicles...' quite appealing, Athlete represented a band who hadn't quite found their niche yet the early signs suggested that here was a band who exhumed a similar resonant blend of quirkiness to that of The Beta Band, and that if their second record was half as good as it's predecessor then their elevation to the dizzy heights enjoyed by oddball luminaries such as Mercury Rev and The Flaming Lips could be just around the corner. Sadly, 'Tourist' is only half the album that 'Vehicles...' hinted at, and that is where the problem lies. One accusation that has always dogged Athlete right from their humble beginnings three years ago - and probably had as much to do with the fact they share the same record label as anything else - is that their music sometimes sounds in danger of being Coldplay-lite, in that occasionally they can be guilty of one forlorn heartfelt ballad too many a la Keane, Dido and Melua. In other words, not good. And that is the main problem with 'Tourist'. 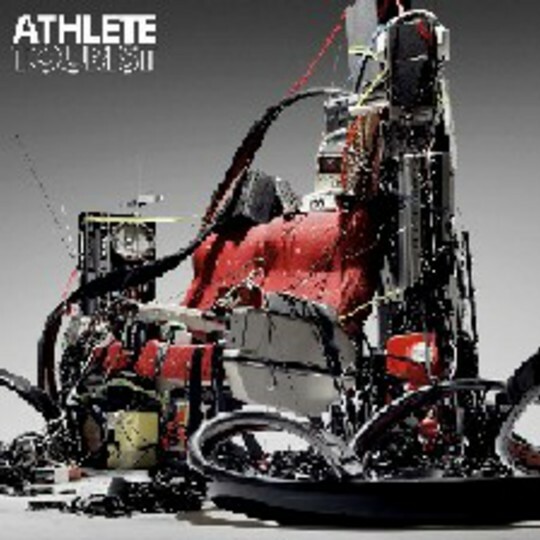 Athlete seem to have found a formula in the studio and left the autopliot in reverse, as the building piano introduction and protacted vocal pronunciations abound throughout 'Chances', 'Trading Air', 'I Love' and 'Street Map' make it difficult to actually tell the four songs apart after half a dozen listens. When Athlete veer away from any trodden path, such as on current single 'Wires' or the call-to-arms stand-off of 'Modern Mafia', they sound like a band who clearly want to escape from the wrought iron bubble they find themselves in yet the head of marketing at Parlophone records won't give them the keys. When Joel Pott sings "It's time to tell you honestly, so we can alter history" on the laconic 'Yesterday Threw Everything At Me' - by far the nearest Athlete get to the reverent collage of 'Vehicles And Animals' on here - it serves as a reminder that this band still has it in them to be special, to be relevant, and even dare I say it, pioneering. It's just a shame then that 'Tourist' isn't the record to accentuate Athlete to a high level of acclaim just yet, but at the same time, it isn't the gut-wrenching, stomach churner that would put people off for life either.